Enache, R.; España-Bonet, C.; Ranta, A.; Marquez, L.
Enache, R. [et al.]. A hybrid system for patent translation. A: Conference of the European Association for Machine Translation. 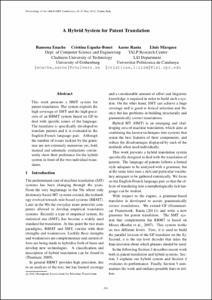 "Proceedings of the 16th Annual Conference of the European Association for Machine Translation: EAMT 2012: Trento, Italy, May 28th-30th 2012". Trento: 2012, p. 269-278.